"OASIS OPEN SOURCE CONFERENCE WED 25 - 27 OCT"
(Ref A - EDI Conferences 1987-1992). General of the UK Confederation of British Industry [CBI] were "spruiking" EDI. we are to prevent similar eCommerce tragedies like the Australian Customs eCommerce debacle. to do business electronically - a term he coined as "Business Process Re-engineering". same International eCommerce proponents as hardware and eBusiness Service providers"
led the way in changing peoples' lives both in work skills and entertainment. However there were many times as an individual when "The Corporate Hat" and "The Family Hat"
were in conflict over "Business Ethics"
Public Funding of CIT projects. retrieval of Electronic Information including eMail. Electronic Information Interchange [EII] process. In fact this is how the Blackberry PDA operates now by using templates. their report that "RUBAC was way beyond EDI"
Compliance progress report for their Customers and Suppliers. The trophy was awarded to 3 OIC members by the King of Sweden in Stockholm. 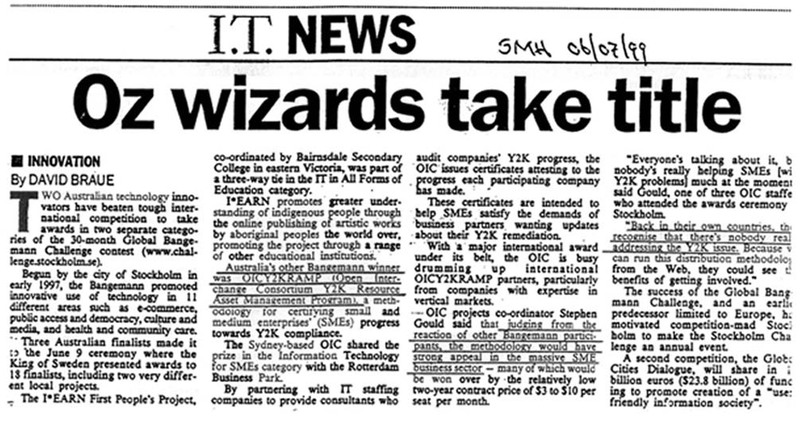 In 1999 Sun Microsystems joined the OIC to promote XML. different tender processes with Local Government tenders. TIMS has been operational since Jul 2000 and has published over 15,000 Government tenders. create confusion that is not in the Public Interest. Agencies on raising awareness of the importance of XML to provide Online Delivery services. the Councils' understanding of XML - an extremely high bar for Surveys ! the final report included the survey results from 51% of all NSW Councils. for about 80 years the principal employer and source of income for many local businesses. Government particularly with CIT issues. and State Government levels, are unpaid elected Volunteers. a new Local Government Act. Development Strategies, Environment Management Strategies and Waste Management Strategies. out by International Firms not local firms. Yet the Mayor and Councillors still carry the Responsibility ! volunteers on a part time basis ! of every company and tradesman in the Council area. whereby sometimes they stack Standards Committees to delay and confuse the Standards process. (Ref H - AS 4590 Address Formats). format to the other AS 4590 format. Development of BizDex with an ITOL Funding Grant. have created a very expensive perpetual Hub for the Rate-payers to fund ! explain the Added Value other than to say "it is too complex for you to run it yourself" ! Legislation passed by the Federal Government in 1999 and by each State in 2000. Australian Local Government Agencies to provide online services for their Citizens. Organisation of Councils [WSROC] that has just published a new tender Service for its members. All of the Councils have a Tender page on their web-site. However many are not used. Added Network Service [VANS]" so the VANS key in the information into the Computer format. Council Intranet and Internet Applications. It should be based on the Complex Address version of AS 4590.
cost" which is passed onto the Australian Public as a hidden cost. by the Federal Department of Industry, Tourism and Resources. Regional Australia and generate real Economic Development projects for those communities. In 2000 he was acknowledged by IBM UK as a World expert in eCommerce. He has advised SME Associations in Britain and Australia on eCommerce Strategies. (Electronic Commerce) of the Aus-USA FTA. 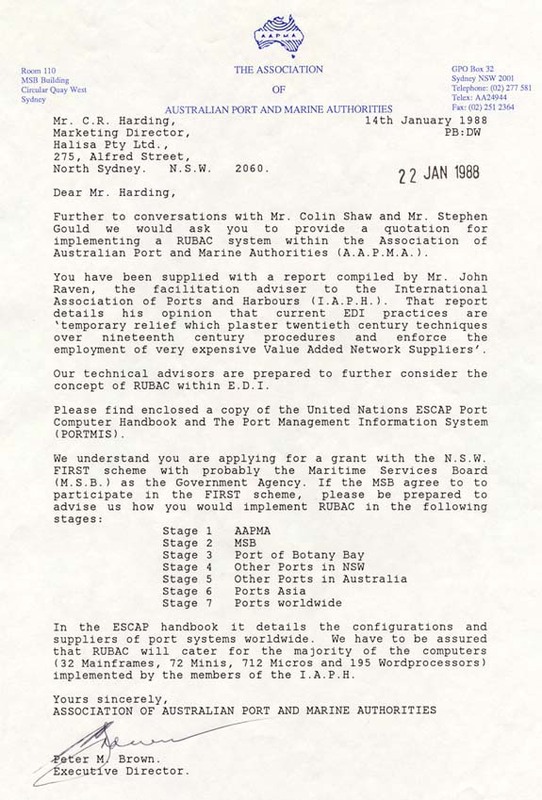 B	John RAVEN IAPH Reference to "expensive VANS for EDI"
C	Extract 1987 Yankee Group Report "EDI in Australia"